Results from a recent SeaDoc Society-funded study show that agricultural lands adjacent to Puget Sound estuaries are surprisingly important sources of nutrients for over-wintering shorebirds. Dunlins are busy little shorebirds you’ve probably seen probing and plucking along the shoreline. When their flocks are startled or attacked by a falcon, they erupt into a beautifully synchronized swarm that flashes and wheels above their feeding grounds. The Dunlins natural winter habitats in the Salish Sea are the estuaries where our rivers meet and mix with the marine environment. These rich and complex ecosystems serve a crucial role for many birds that use them as refueling sites during long migrations—nature’s truck stops for shorebirds and ducks. Unfortunately for the birds (and a lot of other wildlife), 75% of the tidal wetlands in Puget Sound river deltas have been lost due to human impacts like conversion to industrial areas and farmland. 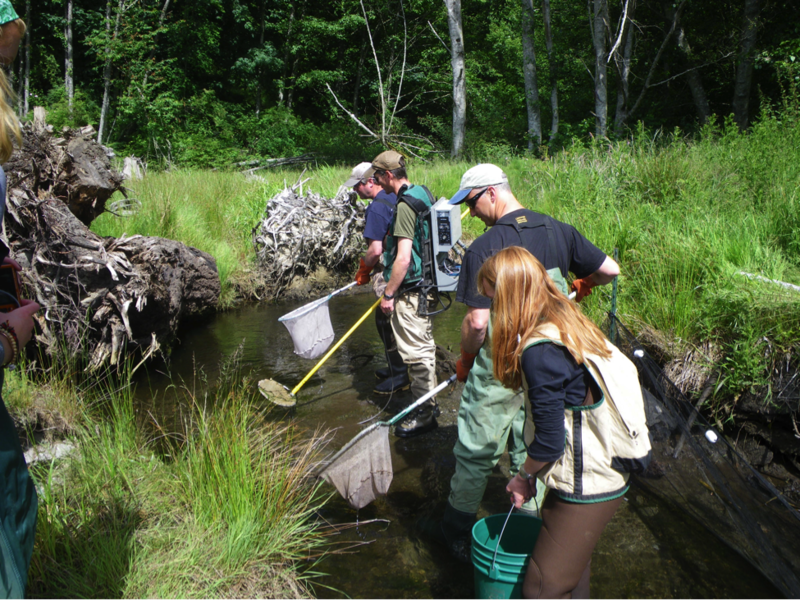 In this study, SeaDoc-funded scientists Keith Hobson (Environment Canada), Gary Slater (Ecostudies Institute), David Lank and Rachel Gardener (both Simon Frasier University), and Ruth Milner (Washington Department of Fish and Wildlife) looked at the Skagit and Stillaguamish River deltas. In both places, more than 85% of the wetland habitat has been converted to agriculture. So, with most of their former foraging area given over to raising grass and clover for cattle feed, what do the Dunlins eat to keep them alive during the winter and provide enough energy to continue their migrations to and from their breeding grounds on the arctic tundra? No, they don’t go vegetarian and start eating clover—they’re strict carnivores—but as the research team from both Washington State and British Columbia discovered, the approximately 60,000 Dunlins that winter on the Skagit and Stillaguamish estuaries do make good use of the farmlands. Scientists used mist nets to capture 171 Dunlins. They took blood samples and then used radio telemetry to track the birds’ habitat use. They also ground up samples of the shrimp, mollusks and other goodies the birds eat in the intact marshes and shorelines, and the juicy earthworms they can find on farmlands, and then used stable isotopes of carbon and nitrogen to measure where the Dunlins were getting their nutrients. While it was clear that the Dunlins preferred the natural estuary, especially the tidal flats and low marshes, they obtained a significantly greater portion (62%) of their protein from the agricultural areas. The later it got in winter, the more the birds depended on the farms. Does this mean we should turn all our natural estuaries into cropland? Of course not. We need to prevent the loss of a single additional acre of wetland, and to restore as much of it as possible so the estuaries can serve the many purposes they provide to a healthy ecosystem. In fact, estuaries are so important, the Puget Sound Partnership identified estuary restoration as one of their vital signs and goals for Puget Sound Restoration. What this study does show is that we need to be especially vigilant about letting any agricultural land adjacent to our estuaries get converted into usages like residential or commercial developments. The shorebirds may be able to hunt nightcrawlers on croplands, but they won’t find much to eat on parking lots. This SeaDoc-funded science not only further proves the extreme interconnectedness of our terrestrial and marine environments, but at a practical level it will help inform future decisions about the management of lands surrounding our critical estuaries. Thank you for supporting science that makes a difference. Banner photo caption: Dunlin eating in an estuary. Photos courtesy of Samantha Franks.